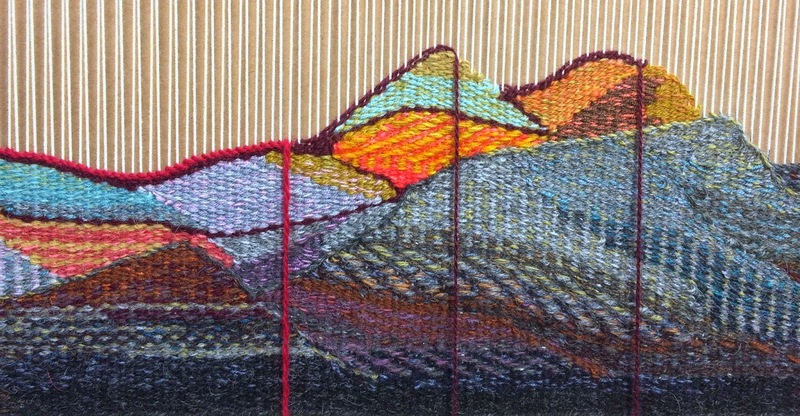 Progress on the 2015 Tapestry Diary is coming along. Here is a photo from January 14th of the whole width. The string markers are there so that I can be sure the divisions for the days of January are spaced correctly. A detail through January 16th shows the days at the middle of the month and the red soumac that I am testing for the marker between the months. The detail above shows the left side of the tapestry through January 18th. Another detail of the middle of the month through January 18th. Finally the far right detail where the month is yet to go. I have been doing a lot of finishing the last week or so also. 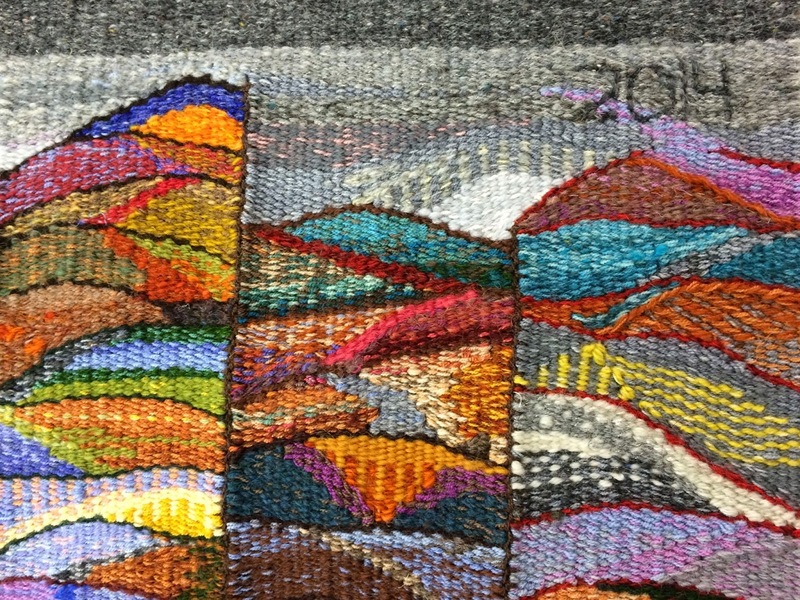 Here is the back of the 2014 tapestry diary before a few hours of trimming. Sometimes I leave long tails on the back that I intend to pick up again but forget so this one had some tails trimmed that went in the recycle pile. Another photo of the back after all the trimming is complete. This is as far as the finishing has gone with this one because I am still thinking about exactly how I want to do it. 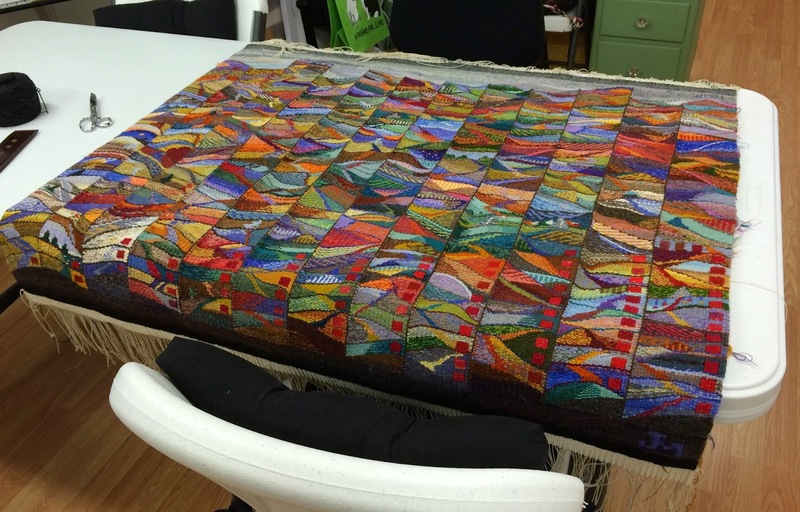 So I decided to take the small tapestry I wove in Joan Baxter's workshop last Fall off my 16 inch Mirrix and finish it next. Here it is right after cutting it off the loom. After trimming the warp and the weft ends on the back I did some measuring. 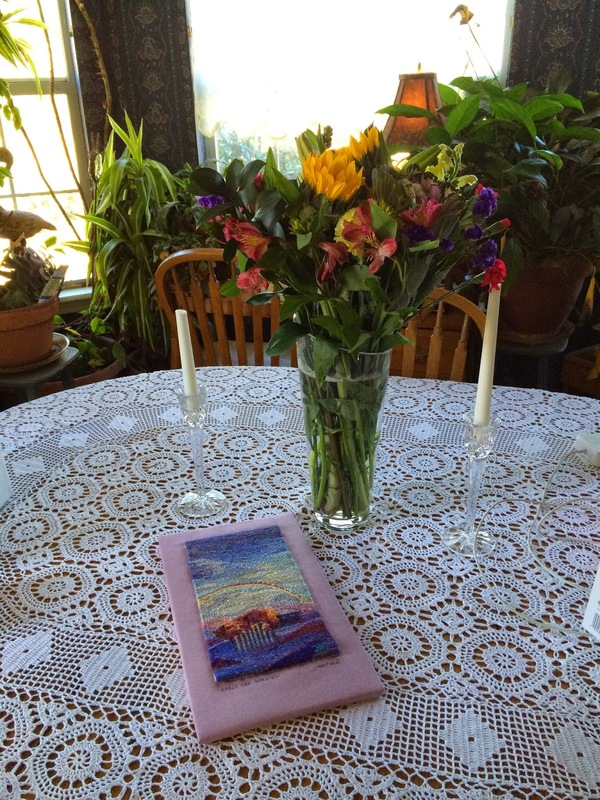 I also found some light red violet linen that I thought would make a good mat for the tapestry. 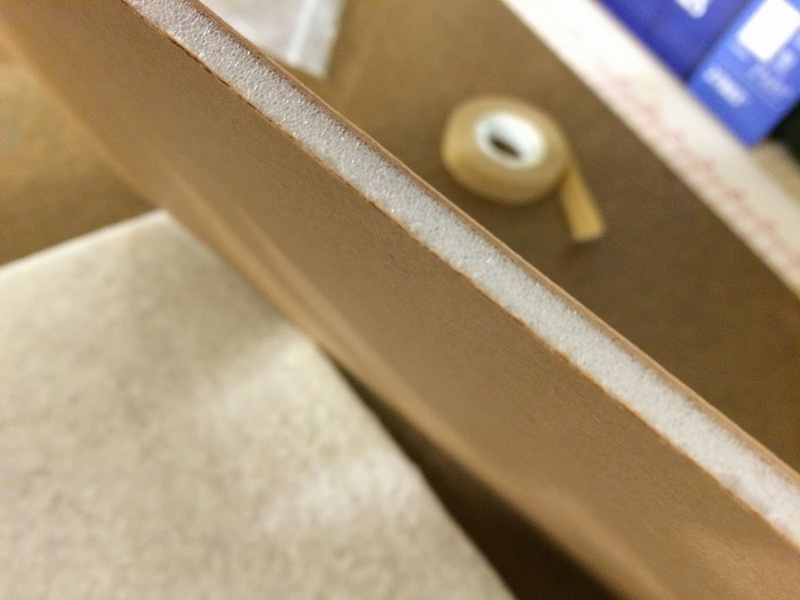 This picture is a little strange but I am using some acid free foam board that I have used in the past to mount canvas on for light weight painting panels in the field. I cut it to size to give a nice mat all around the tapestry. 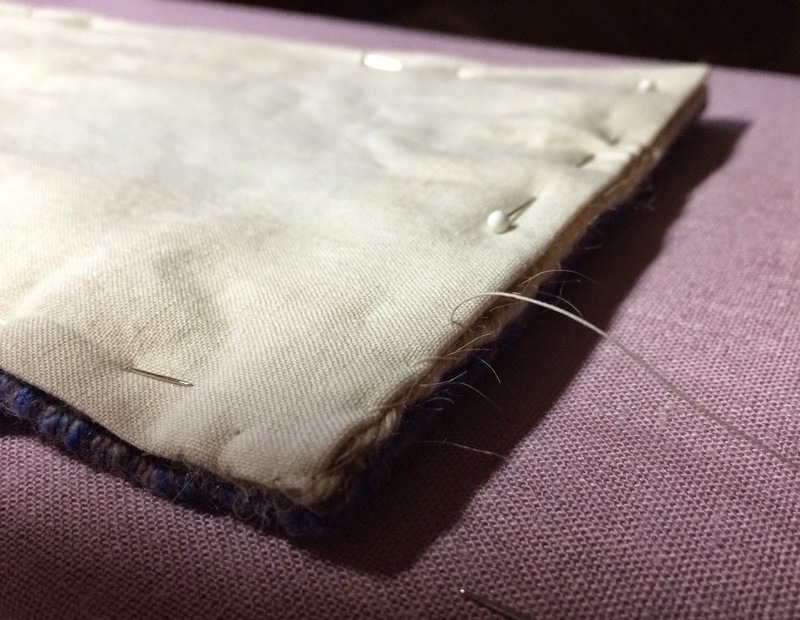 Then I covered it with a thin piece of 100% cotton batting. 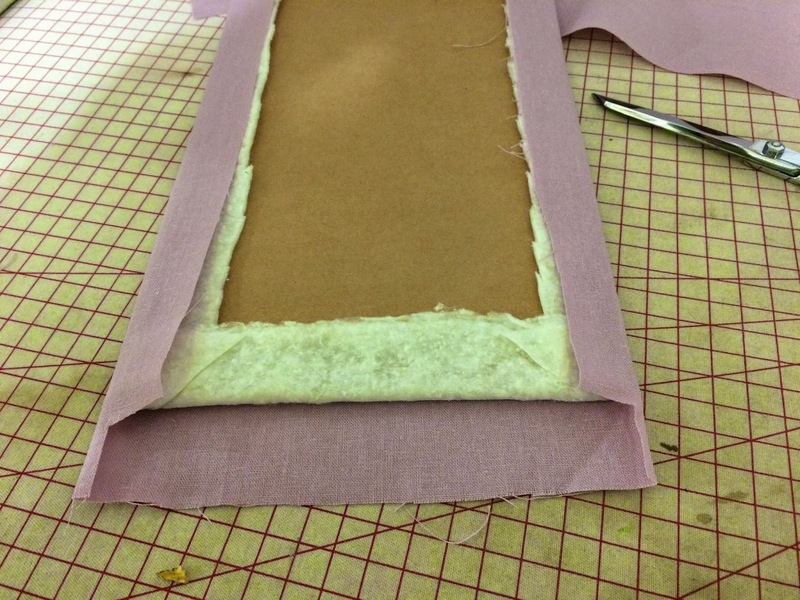 The batting gives a nice smooth appearance and also makes it easier to sew the tapestry in place later. 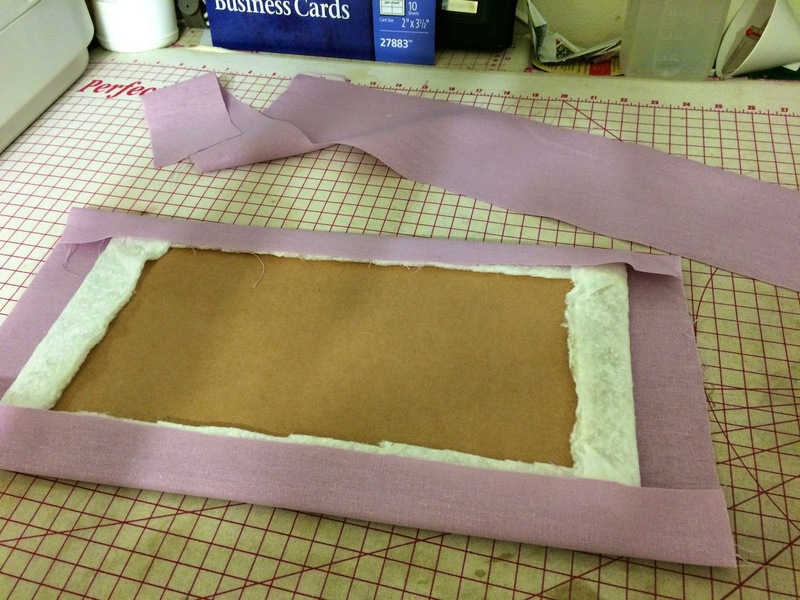 I have used a small amount of a PVC glue to adhere the batting to the back of the board and then I cut the linen. I wanted the corners to be neat so I did some trimming of the bulk before turning them. 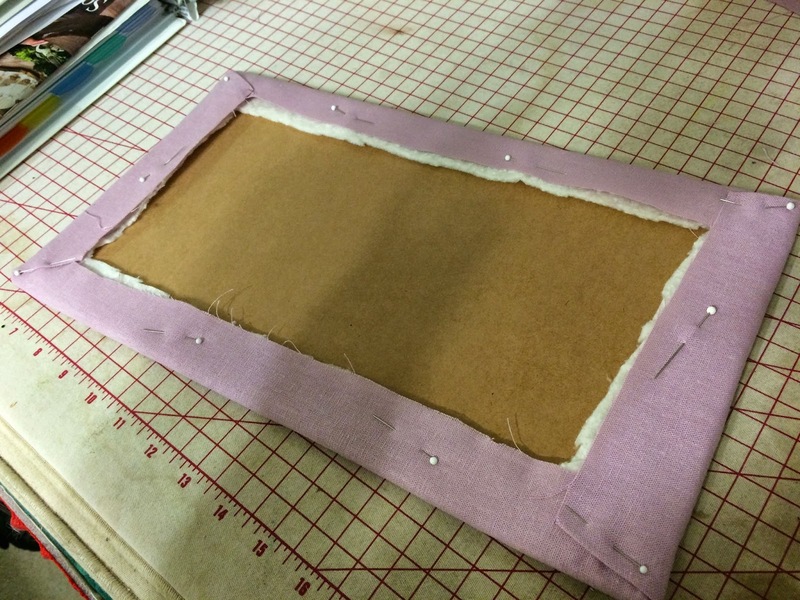 The photo above shows the linen pinned in place and then I did some light stitching to hold it securely. and then whipped it lightly in place. 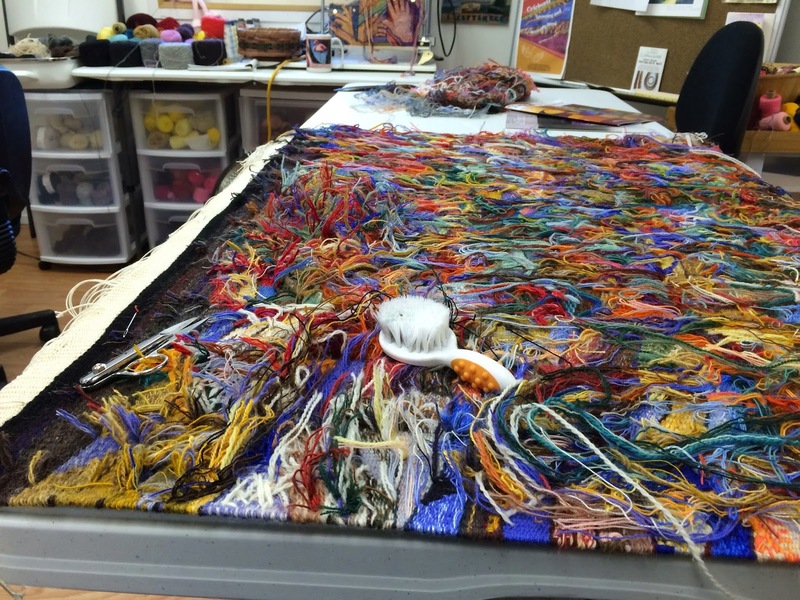 Above is the finished piece with the tapestry stitched in place on the mat. 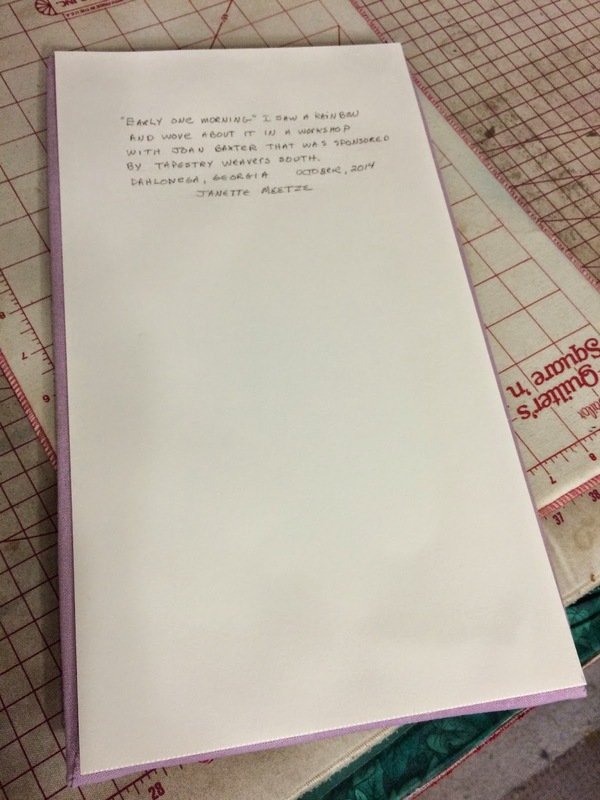 I signed and titled it on the front with permanent ink. The title is "Early One Morning". 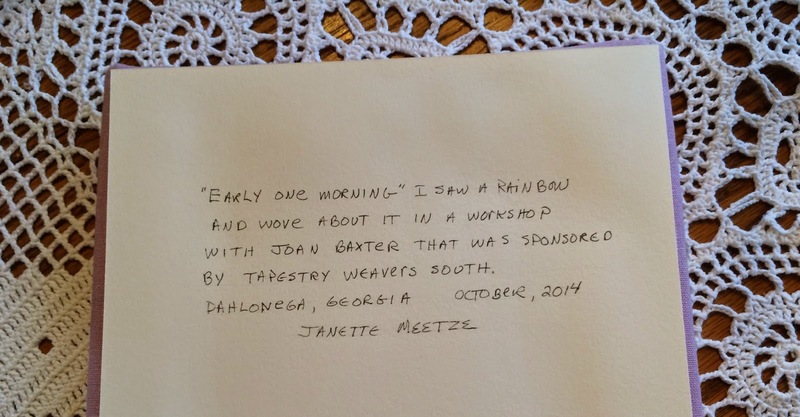 On my way walking through Dahlonega last October to the Joan Baxter workshop I saw a rainbow and somehow it just worked its way into the weaving I was doing in the class. and then added some information about the tapestry to the back with a permanent pen. I let the whole thing sit over night under the weight of a couple large books and now all that remains is to have a frame made for it. 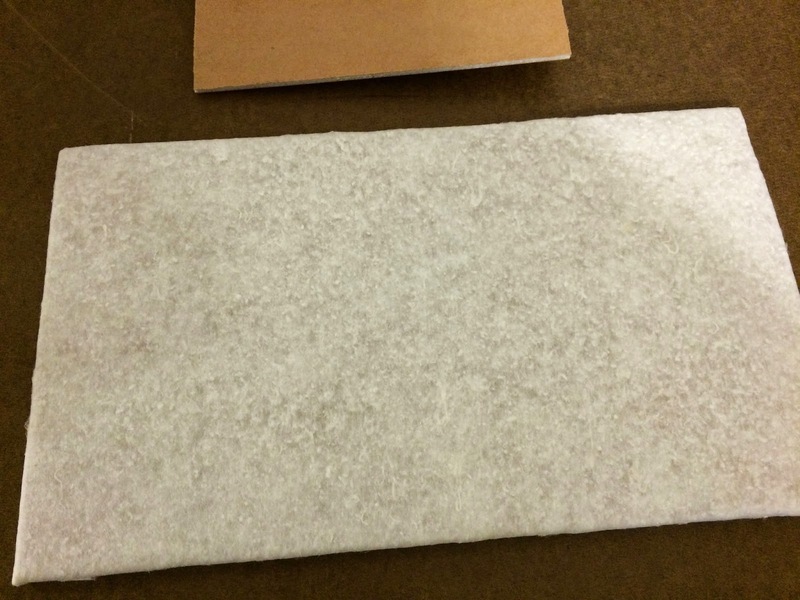 The final measurement is about 14 x 8 inches. All ready to frame with my Birthday flowers this morning. 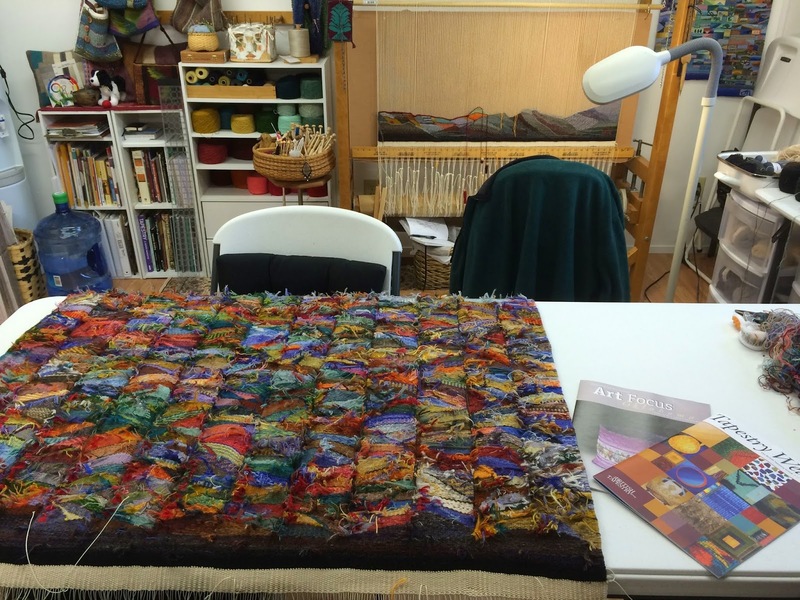 Now the plan is to go back to the Hands tapestry and finish the weaving before the new tapestry loom arrives this Spring and of course I still have the 2014 tapestry diary to finish. I also have been ordering supplies for the Fiber Studio. A large new order of Ymmyarns is on the way and also new Mini Bobs and Awl/ Keeper sets from John Moss. I have some of his regular and slim brass tipped bobbins in stock also. December was so busy that I also sold almost all the Mirrix looms I had in stock so I will be replenishing Mirrix soon. I usually have all the smaller Mirrix from 16 inch on down in stock and can order others. If anyone is interested I also have a lightly used older style Mirrix treadle that I would like to sell. 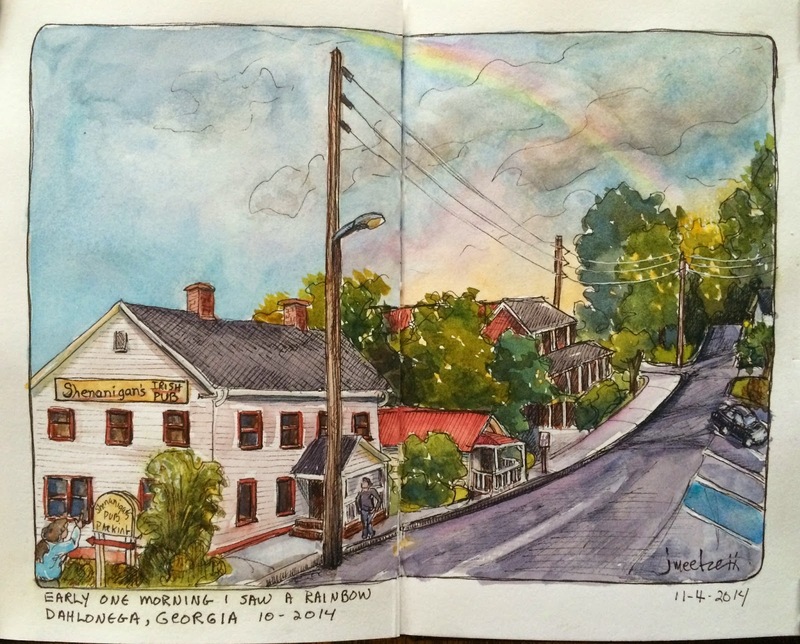 Finishing today with the sketch I did of the rainbow sighting in Dahlonega. The building on the corner at the end of the street is where we stayed while there. Nice memories all around! 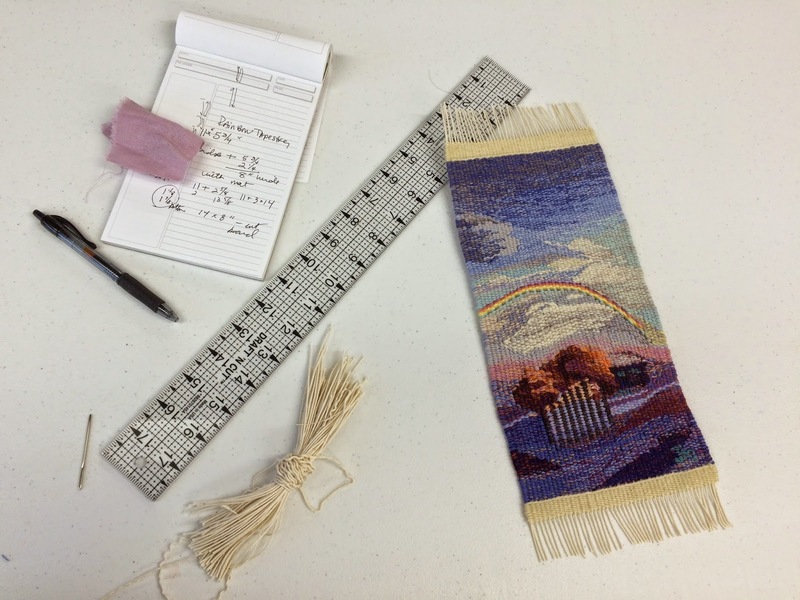 One week in on the new 2015 tapestry diary. It is taking a little longer at the beginning because I am weaving an environment for the days to rise out of. I did that a little last year but this year is a bit more elaborate. 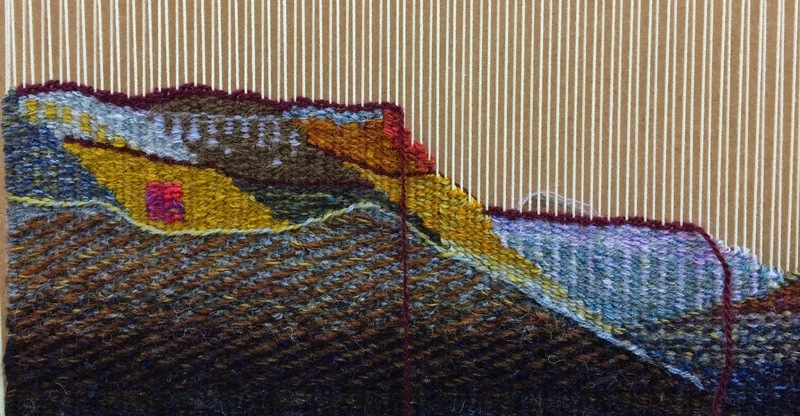 I am weaving the base of the tapestry somewhat ahead of the days but once it is complete the days themselves should be pretty easy to keep up with. For months now I have had an idea to continue to work with a journey theme but this year instead of hiking I am climbing. It is kind of funny really because I don't like heights much. I do like the idea of climbing though for several reasons. 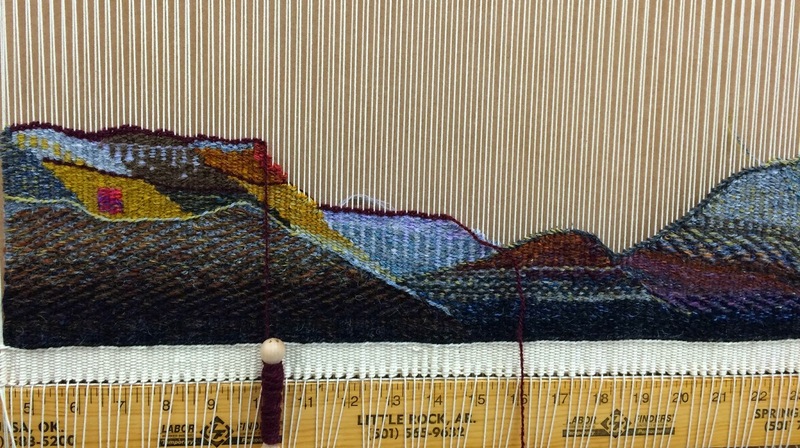 It is very appropriate for the actual act of weaving a tapestry because I am literally climbing up the warp as I weave. I am viewing each day as a step as I weave my journey. For me the idea of climbing connotes finding a foot hold and conquering inertia, gravity and fear. All of these ideas seem appropriate baggage for a creative journey. After viewing the third installment of the Hobbit series I have come to think of this years journey as climbing the lonely mountain. Creating anything can sometimes feel like climbing the lonely mountain! The days are going to read from right to left and left to right as the months go by. I am going to use the red squares again to designate the months. The gold shape with the red square is January first and the second is right above it. The days of the month will climb across the warp in twos although to accommodate the different number of days some will just have one. A pass of burgundy separates the days and then a contrast color will separate the months. There will be irregular shapes on the sides that will enclose the days. There should be quite a variety of sizes in the individual days depending on what the design calls for. February will start on the right and work back across and up the warp. It should be an adventure. Today I crossed the frozen valley and that is a fairly literal interpretation of the day. Here is a detail of the center part of the base and I am still in the process of woking across. I have been using the twill with ground weave technique that I learned for last years diary quite a bit and I like the texture and directional quality it has. A closer view of the far left side where the days of the month have begun. 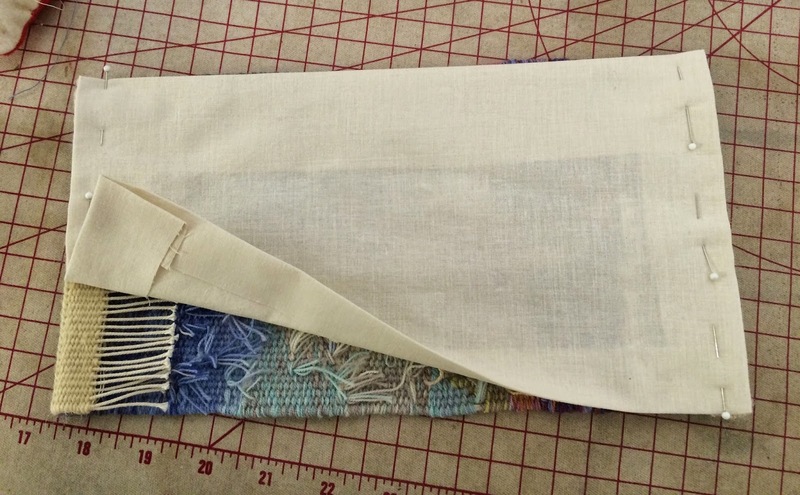 I think this idea will also lend itself to continuing to experiment with different weaving techniques in the coming year. One more detail of the days so far as they rise up from behind the foreground shapes. I'm looking forward to seeing where this year long adventure will lead. 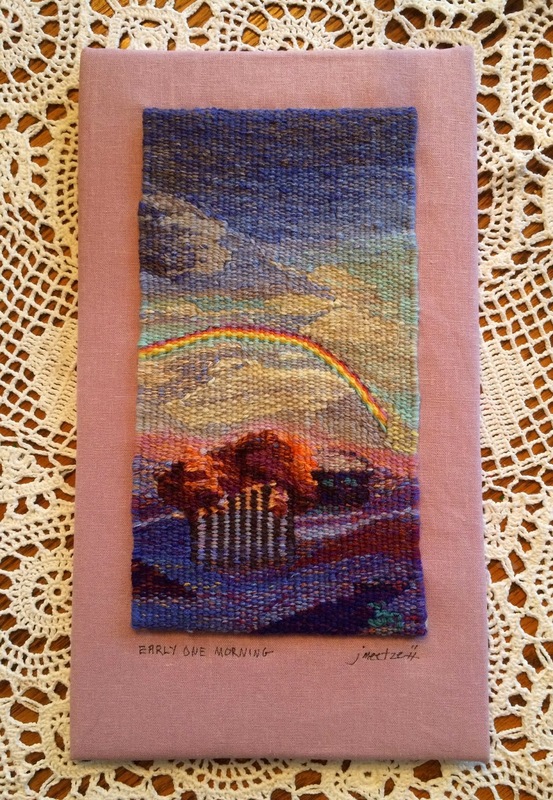 When I posted about finishing the weaving of the 2014 daily tapestry a friend replied with an interesting question and I have been thinking about it ever since. " Does your blog keep you inspired to weave each day and work through those uninspired periods or do you even have those periods? I have days and even weeks that I just don't have the motivation I need to push through! Please share." 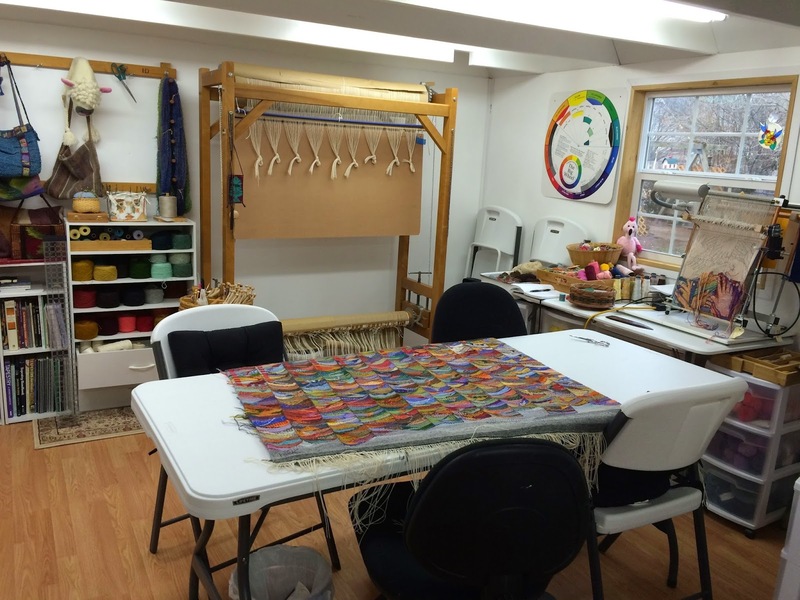 My first response was to think that the weaving inspires the blog not the other way around and then I realized that it actually does work both ways. I originally started the blog as a way of making connections with people of similar interest. 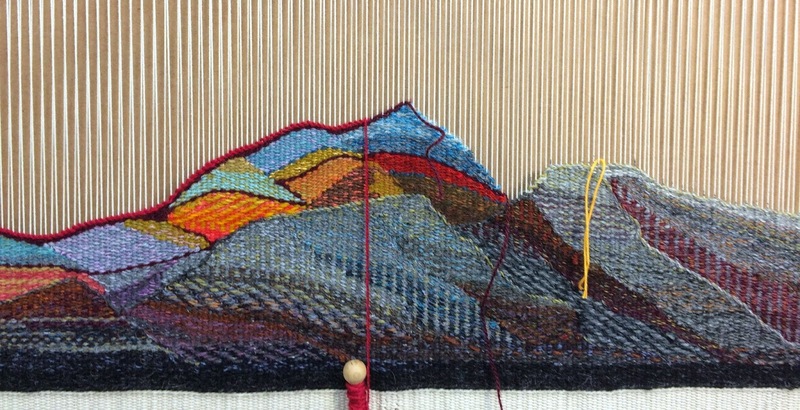 Having a blog does make the process of weaving a tapestry seem a little less like climbing a lonely mountain and it does help motivate me to be able to share with others. I have thought that I should be writing the blogs more often and even considered a resolution this year to write both of my blogs once a week. I quickly banished that thought! I try to write a post when I have something to share and I think that trying to do it once a week would not only take important time away from actually doing the work but it might also make my motivation change from communicating about the work I have done to trying to figure out what to write. I decided that for me the work should come first and then the blog. Do I have periods of low motivation? Of course I do, but I make a decision to weave this diary everyday and then I just do it. It helps a lot that I have a framework set in place for the daily project so that even on days when I feel scattered or lacking in imagination I can still weave my day. An important part of this equation is having some rules set up so all that is required on a daily basis are small decisions that are easily made. The big decision, to do it, has already been made and the rules have already been established. Some days are just difficult. Often what seems to be a difficult day gets better once I am working and I can then move onto other things in the studio with more positive energy. Sometimes for various reasons I can't weave my day but I always make it up somehow. I am excited by what can be achieved by this way of working and that also helps to motivate me. After all this is something I choose, I make the rules and if I decide they aren't working I change them. How many things in life are so satisfying? I'm looking forward to sharing my daily tapestry journey this year and watching my work evolve one day at a time. 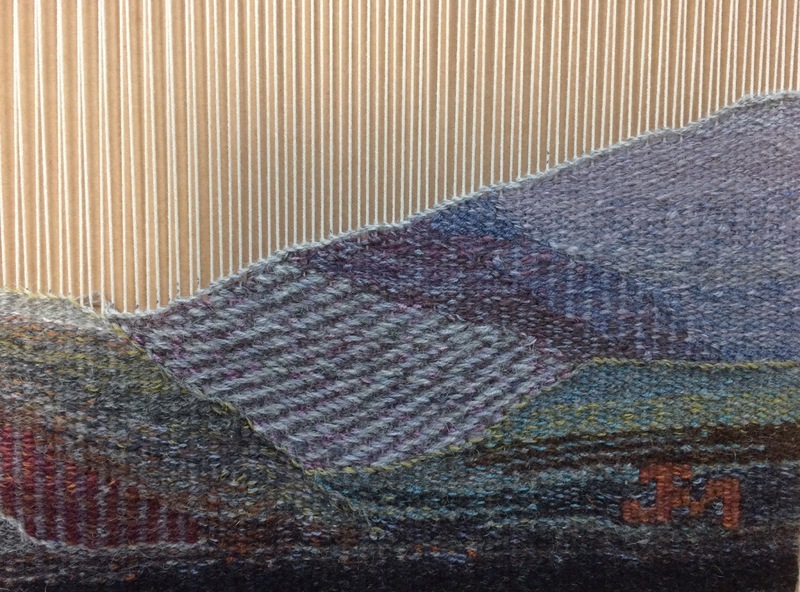 I have been putting in some long days getting the 2014 tapestry diary off the loom and the new 2015 tapestry started. I have been wondering why it is taking so long and then it struck me, the 2014 tapestry is almost six times as wide than the 2013 tapestry. Measured off the loom today it is 33.5 inches by 40.5 inches. This is the end of my second full year on the diary series and my whole year is stretched out before me. 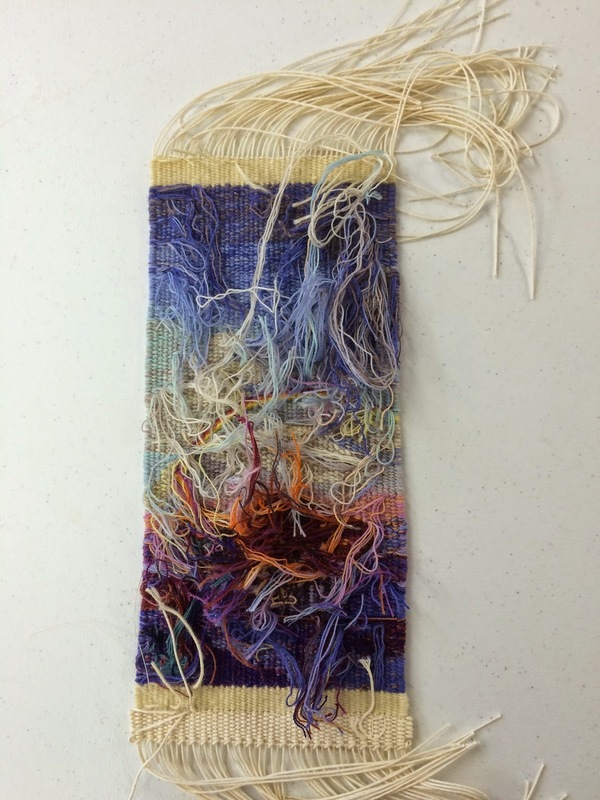 The 2014 tapestry is my journey through the year and the many paths I've taken. 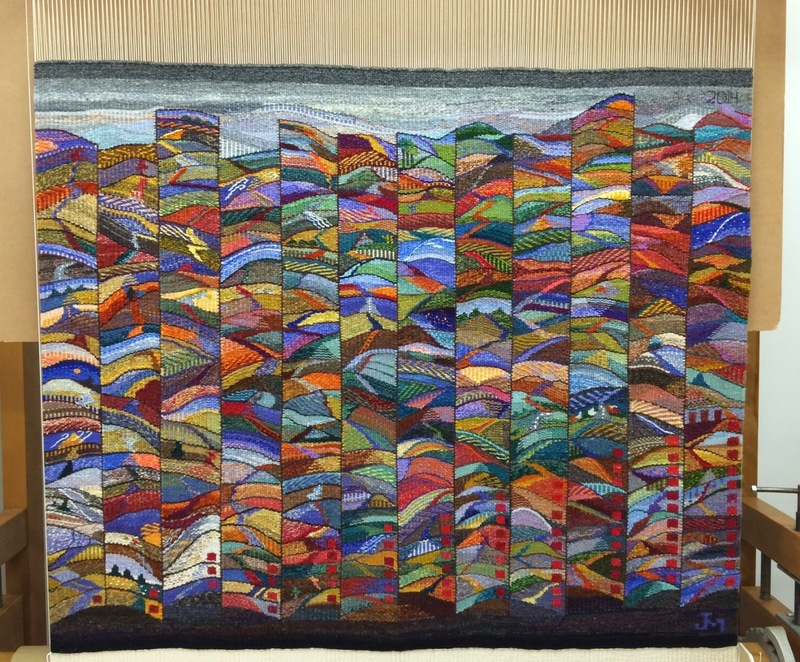 It is Oklahoma country roads and city streets, flight paths to Rhode Island and hi ways to Georgia woven around long weekends with friends and many days observing the world through the window of my studio. I've been looking at sunshine and shadow, watching things grow, bloom and fade and noticing the changing parade of color and weaving all about it. I have been learning some new tapestry techniques in classes I've taken and books I've read and weaving all about it. There have been days when I couldn't wait to get started and days when I couldn't wait to finish and many many days when I thought that if there was just one more thing to do everyday and I would surely explode. A year can seem incredibly long one day and impossibly short the next. Before I cut the tapestry off the loom I had a clean up session, putting yarns away and clearing off the table. Laid out on the table my first impression is color, or is it movement? I am not sure. I like the red squares that designate the months and the pattern they create. Each day has a pass of contrasting color that separates it from the next but on December 31, 2014 in the upper right corner I decided to leave a path open in one spot to ease the transition to 2015. It has been a good year but it is time to move on. 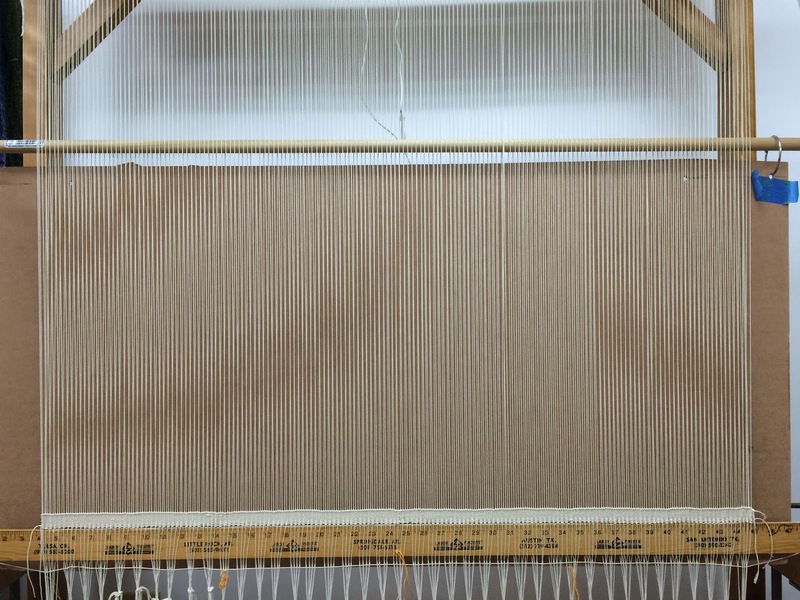 I have been getting my warp in order and the foundation laid for 2015 and I hope to be posting about it soon. I am always looking for the perfect warp. The perfect number of threads laying next to each other in perfect harmony, nothing crossed or twisted, no empty or doubled dents, nothing in front that should be in back or vice versa and no do overs. Now I know how those surfers feel looking for the perfect wave. We know its out there, that stunning junction of mathematical precision with the proper planetary alignment and a smidgeon of serendipity. I'm still waiting.